The 2018 Asian Pacific American Gubernatorial 2018 Debate at the Sexson Auditorium at Pasadena City College. Demonstrating the current polarization of the political scene, even in heavily Democratic California, boos erupted several times during Friday evening’s gubernatorial debate at Pasadena City College. The first instance came when former Los Angeles Mayor Antonio Villaraigosa was introduced, and continued any time either of the Republican candidates, Travis Allen or John Cox, mentioned President Donald Trump by name. 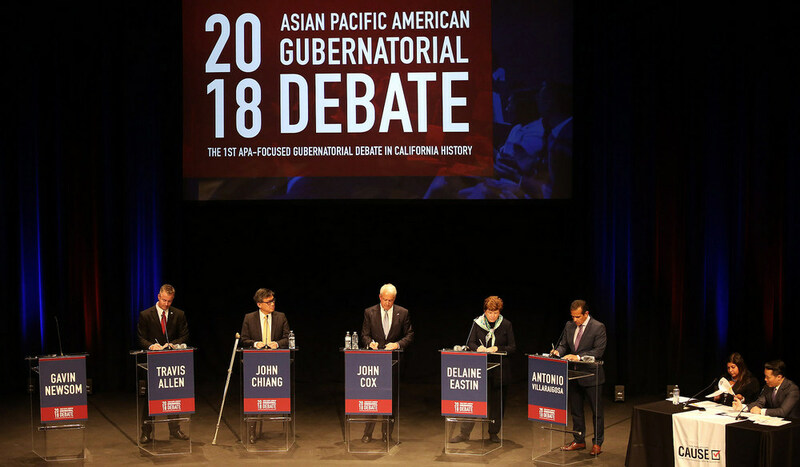 Friday’s debate, which was attended by several hundred, was the first Asian Pacific American-facing gubernatorial debate in California history, and featured Republican Travis Allen, Democrat John Chiang, Republican John Cox, Democrat Delaine Eastin, and Democrat Villaraigosa. Democrat Gavin Newsom did not attend the event. His office did return calls or emails from Pasadena Now. The debate was moderated by Richard Lui, of KNBC-4, and Seema Mehta, of The Los Angeles Times. Questions centered around healthcare, housing, environment, language accessibility and education. The group of candidates was a relatively accurate spectrum of political leanings with Cox and Allen—Republicans with little chance of winning the state—hewing closely to a conservative, anti-undocumented, and anti-tax stance, while candidates Chiang, Eastin and Villaraigosa supporting varying degrees of liberal and progressive positions. Asked about the hot-button immigration issue, both Cox and Allen stressed border security and crime, with Cox calling Mexico a “corrupt and out-of-control country,” while Eastin noted that half of California’s businesses have at least one immigrant as a founder. Villaraigosa pointed to a recent study by the American Academy of Science, which determined that undocumented immigrants commit less crime than native-born Americans. Allen lamented the current quality of California’s education and noted that the system, once the nation’s best, is now in the bottom of the rankings. “We must fix our education system,” he said, emphasizing school testing at all levels. Cox criticized educational spending, saying that too much was spent on administrators and not in the classrooms. ‘I want to see teachers paid like rock stars and athletes, based on merit,” he said. Asked about climate concerns and the U.S. relaxing a slew of environmental regulations, Chiang said, ‘I believe in Climate Change. I disagree with the president, who said that it’s a hoax, created by the Chinese. Climate change is real.” Chiang said he would work to create a state that was fossil fuel-free by 2045. Addressing the housing and homelessness issue, Cox, who worked in the construction industry, said he would streamline construction regulations and claimed to have a plan to build three million homes in California over the next ten years, though he did not offer details. His remarks on housing prompted the attack from Allen. Meanwhile, Eastin declared, “We need a full court press to make sure we’re building homes close to transit hubs,”, while Villaraigosa acknowledged that the cost of housing is the reason why California has the largest number of homeless in the country, and outlined a wide-ranging plan which included transit-oriented districts, “granny flats,” and housing trust funds. The California Gubernatorial election is scheduled for November 6, 2018.